I'm an advocate of stocking your pantry with spices. Aside from being economical, you can fore go buying pre-packaged seasoning mixes. They tend to have more sodium in them, not to mention some have MSG. But I digress. Having a stocked pantry of common spices allows you to make seasoning mixes to fit your tastes. Such is the case for these chicken fajitas. The seasoning is a combination of salt, pepper, garlic powder, onion powder, chili powder, cumin and cornstarch. That's it! These spices are combined with chicken broth and oil to create a marinade for the chicken. After a few minutes of chilling, you're ready to sauté and your fajitas will be done in no time! 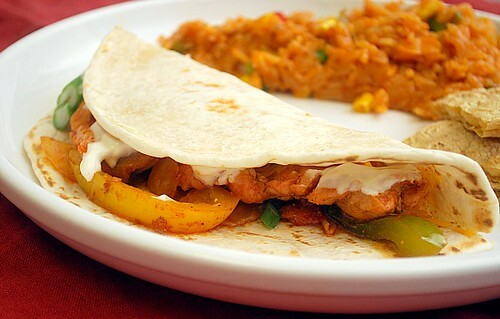 We enjoyed our fajitas with some sour cream and a sprinkle of shredded cheese. To pair with the fajitas, I served them with Mexican rice. In a resealable plastic bag, combine the chili powder with the salt, cumin, onion powder, garlic powder, cornstarch, chicken stock and 2 tablespoons of the oil. Add the chicken, bell pepper and onion, seal and knead gently to coat. Refrigerate for 15 minutes. Transfer the chicken and vegetables to a large bowl and serve with the warmed tortillas, lettuce, cheese, salsa, sour cream and lime wedges. I made these for dinner tonight and they were so good! Thanks for the great recipe! Yummy!!! This is my favorite dish.great share.